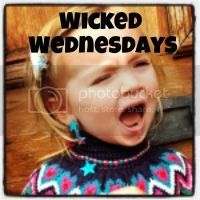 Hello and welcome to this weeks Wicked Wednesdays! Before I carry on if you've stumbled across this post and need further clarification on why I do it and what's it all about please read a post I wrote earlier in the week here. If you're not new? Welcome back! I hope you have had a lovely week. I am still in the midst of potty training doom and my beautiful girl got an awful sick bug at the weekend so it's been pretty grim. Thanks so much to all the lovely linkerupers last week. My favourites were birthday party blues from Sounding Like My Mother, and AMAZING fake sick note from Northumberlandmam and one that really reminded me of my own sweet boy from Sleeping Through Yet. Ace shots that really made me laugh. You know the score link up, comment lots and watch the comments in return. Tag me on instagram so I can like and comment on them too. Also a lot of people put photos on my Facebook page so if you fancy a giggle go and peruse them too! Have a lovely day!